Previous Previous post: Has Atheism become a Religion? Everyone knows the BofM took place in present-day Utah, and that modern-day cities like Manti and Bountiful are in the same locations as the ancient cities of the same names. So it must be true. Seriously, I was actually taught this one in seminary. The covenant that God made was with America, not South America. Also, I don’t believe Moroni walked all the way from South America or Mexico to hill Cumorah. Hill Cumorah is hill Cumorah and the events of this sacred book took place here in America, the promised land where there would be no Kings. I am leaning his direction, but think it was much broader. We have amassed 330 million people over the last 240 years; I would think they could have at least that or more over 600 years. Also, there was massive destruction and change of the land before Christ appeared, so I think the landscape was much different. Finally, I study this soley for entertainment. It is a scared book and one must gain a testimony by the spirit. I have done this and it was a life changing experience. The spirit provided a compelling witness the Book of Mormon is true. It was the ultimate object lesson. 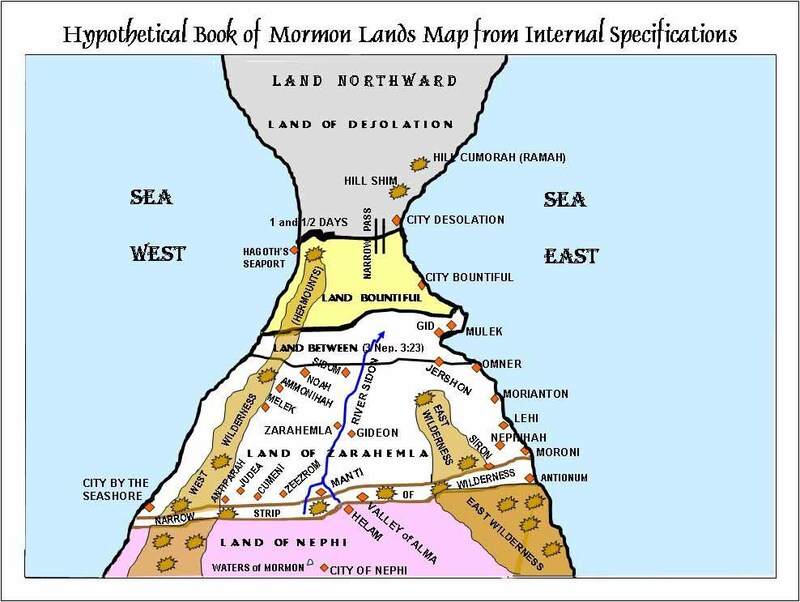 Ultimately, I think the geography of the Book of Mormon is not clearly defined by the church ir God as they want us to seek confirmation by the spirit. Maybe this is a case of “choose all that apply”? I don’t think the BOM is a historical record but I think it was NYS that Joseph Smith had in mind when he wrote it. Yes, I’d bet the farm he wrote it. The WORLD population at time of Christ is estimated by most sources to have been 200-300 million. Where did you get that; the 30AD census database. They believed a lot of stupid things over the ages: the world was flat, raw sewage running in the streets is fine and leeches cure diease. Back then, they could create babies just as well as we can. Even with the diease and famine; basic math supports more than that. Ah, yes, Ken. It is a conspiracy. Ken, did you read any of my reviews? As an archaeology student at BYU, it was fascinating to hear the different private opinions of the professors there (North, Central, and South American theories were all represented). No curent theory has satisfied me by conforming to all internal evidence of the book. If I had to put money down, I’d bet on an undiscovered small civilization in Central or South America. Those jungles absorb and hide archaeological evidence like nobody’s business. Btw, no student trained in studying ancient Utah cultures would ever tie BofM events here. Just sayin’. Not a conspiracy; just they didn’t have very sophisticated data collection techniques or communication equipment. Most of the people that lived back then had no idea these parts (all mentioned) of the world existed; thus, there was no way to provide accurate WORLD population estimates. Dunno. But then I don’t know how we recently got pictures of Pluto from a spacecraft scientists built, either. Not really interested in trading ideas with someone who thinks Meldrum’s work is “compelling”. that is a conversation leading to extreme snarkyness on my part. Have a good day. At least John Sorensen pulls out all of these quotes and flat out says that Joseph really didn’t know where the BoM lands were. Meldrum ought to do the same. Meldrum’s got other problems, but if you can point me to a book that actually explains his theory, I will do a formal review. Up to now, I have only seen pieces (and his DNA stuff isn’t nearly so solid as he claims), and I don’t want to do a review if he is only giving pieces and not the whole theory. Suffice it to say, there are serious problems with all of the North, Central, and South American theories. But it is fun to discuss! Ken, you do understand that those estimates of world population are not based on tallies created by people from the ancient world, right? And, yes, there are very defendable methods of estimating past populations. Populations grow at exponential rates, not geometric. Basic math supports smaller numbers. Agree with what you said. He also has some issues with geography; like the flow of rivers. Like you, I enjoy reading about this kind of stuff. Modern groups have tried to use ancient records, among other things, to estimate world populations. With 91 votes so far, a strong 46% plurality votes for “None of the Above. BoM is not historical”. I know WheatandTares is true! My belief is that Lehi’s party landed somewhere on the South American coast, not far from the “Tree of Life” sculpture. In time, as both Nephites and Lamanites not only had their interactions with each other but likely existing indigenous cultures, the BoM locations that we’re familiar with up to and including III Nephi were likely fairly much confined to present-day Nicaragua, Honduras, Guatemala, and El Salvador. After the events described after Christ’s appearance to the Nephites, and the some 200 years of relative peace, Mormon describes a condition of significant urbanization and population growth in Mormon 1:7. It’s my conjecture that due to prosperity and fecundity (a nation of Duggar families), as well as PEACEFUL assimilation of neighboring cultures, that the Nephite-Lamanite ‘nation’ was far larger than it had been at the time of Christ’s visit. It may have even extended well into Mexico and parts of the present-day United States. However, I find it interesting that such a large PreColumbian nation not only left little if any artifacts of its existence (an strong argument against its existence at all), but that no seafaring cultures ever, to the best of our knowledge, encountered it. It’s my belief also that the events described in Mormon, including the Battle of the Hill Cumorah, took place south of the Rio Grande, likely within sight of the volcano Popocatépetl, which is my conjecture as to the “Hill Cumorah” for the battle site. The one in New York is likely a namesake, just as there are several mounts named “Baldy” and numerous cities of “Springfield” in the US alone, let alone foreign equivalents. Oh, the Book of Mormon is not historical. Well, I know that is not true. I guess that is only good for me, though. The only thing about this is that you should tell us more about what YOU know – not about what you do not know except what is said from a group of people who may not know what THEY are talking about – and they really don’t know what they are talking about. Since 2011 I have read all the Standard Works of the Church each year and yet that does not seem to match the volume of writing you go through. I consider the Holy Scriptures very important. I think Mormons, including the leaders, are rampantly wrong in some of the interpretations they make. What does that have to do with the truthfulness of the Church. I’m going to try to force my brain to read and learn everything you wrote. It will not be easy, not because I consider it boring, but because reading seems hard for me and I also am troubled by the weakness of the people (in the bloggernacle) going against the Church of which they are members. I go against some of the things the leaders say, but The Church of Jesus Christ of Latter-day Saints is the Lord’s church and that’s all there is to it. When I read and learn what you have reported I’m not going to tell myself that it isn’t important because both the Church and the Book of Mormon are of God. Don’t be surprised, though, if I won’t be able to say anything intelligent. Trust God. This is His Church. Just how small. Those hiding spots are getting smaller and smaller. Instead of solely an archaeological perspective( and there is no archaeological evidence supporting the BoM), consider adding a ecological approach. The crops and livestock the Nephites brought with them were adapted to a Mediterranean environment. For those crops and animals to have prospered and thrived in competition against native species adapted to their environment, the only spots matching are California or Chile. There are in these two locations from the appropriate time period,no bones,feces,seeds or pollen matching those from the Mediterranean. Secondly, the Nephites had writing, metallurgy, cement as well as livestock. This would give them a huge technological advantage. So even if neighbors kept their distance, they would have seen the advantage of copying the technology. Which leads me to my main point, according to the BoM Jesus Christ came to the America’s where the Nephites rebuilt their cities and lived in a Christian Golden age spreading this culture across the land. Yet this hugely significant event failed to diffuse. Okay, here an addendum. If one looks at the landscape of the BoM what does it describe. Is it a jungle? If the BoM took place in a jungle, what should we see in the narrative. What culture would be described. Is this found in the BoM? Majority of events take place in Chile and Peru. Horses, Cheetahs, Bison, and Gray Wolf bones, from the Ice Age, were excavated from a sinkhole in Wyoming in June 2015. Scientific American published findings August 8, 2015. You do know when the ice age was? If you’re near Twin Falls, go over to Hagerman Fossil Beds National Monument and have a look at an early species of horse. The end of the Pleistocene saw the mass extinction of many large mammals including horses in the America’s around 10,000 years ago. The European wild horse managed to make into the 20th century before it also bit the dust. Chile has Monte Verde,an archaeological site, from 13,500 years ago. So people have been living in the area for some time. What Chile and Peru lack is any archaeological evidence, particularly in area’s where it should exist, of anything to support the BoM narrative. But Peru does have Jungles. Can a book be scripture without any degree of historicity? Yes, absolutely. Any work can be significant, even sacred, without necessarily being historically accurate. The BofM could be a complete fabrication, but that doesn’t reduce it’s value as a religious text. For example, if I were to study the Quran, even just academically as a non-Muslim, I would probably still find some historical, literary or even spiritual value in it. Though it may not be sacred to me, I can’t dismiss the fact that over a billion people on earth hold it as such. I suppose it comes down to what your testimony is based on. Will it really matter if archaeologists never find pre-Columbian horse bones or steel swords? Or if DNA evidence fails to prove that Mesoamerican or Polynesian peoples were actually descended from one pre-Christian middle eastern Jewish family? Or if it turns out that a common Egyptian funeral text is not actually a record of biblical Abraham? Nonetheless, the text of the BofM, and the lessons contained therein, still have a great deal of value to humanity. If JS really did create it from whole cloth, that in itself is a miracle worth believing in. SNielsen, you have an excellent argument. I have no interest in using archaeological (or ecological) data to attempt to prove the historicity of the BofM. I’m willing to participate in a just-for-fun poll asking for ideas on BofM geography because I love the range of opinions on this site. My belief in the Book of Mormon comes from a source science considers irrational. I’d love to offer a better defense, but like I said before, no current scientific evidence for the different BofM geography theories is satisfactory to me. I would agree with you if JS had never claimed it was accurate. But how do you assert that it is still sacred and all that wonderful stuff if JS said it was “the most correct book…” and it’s not accurate? If it’s not historically accurate but still a wonderful, inspired book to help/save humanity, why couldn’t Joseph Smith have just said that? I wish I could poll my ward anonymously this way. After multiple comments about whether the BoM can be valuable scripture if it is not historical, my concern is that it (to me) means something fundamentally different as a historical document. If it is a literal, historical document then it would seem to teach of (American?) exceptionalism as an eternal truth, that dark skin is a curse, that it’s okay to kill a defenseless drunk and steal his property if you really need it, and a number of other things that I wouldn’t glean as lesson material from a less literal reading. If it is not a literal history, i would glean totally different lessons from the stories and symbolism. It seems to be am important distinction. Any claims of BofM historical accuracy made by JS himself (“most correct book”, etc.) should also be considered in context, as being filtered through his own biases, opinions and limited worldview. I came to the personal conclusion that the BofM may not necessarily be factual, but is perhaps more allegorical than historical. This has helped me stay in the Church after a faith crisis. I can still feel good about reading it and learning from it, and having it as the foundation of a healthy belief system, without having to do all the mental gymnastics of trying to justify the geography, anthropology or the obvious anachronisms found throughout. The apologists can go on chasing their tails, but I have no interest in that. If one day, the Church finally concedes that the BofM is not really historical, my testimony is not going to fall apart over that. The problem, of course, comes from the fact that the Church has taught for decades that the BofM is a factual historical record and should be taken literally. If that approach works for most believing LDS members, fine, but that also may be a house built upon sand. But maybe we were wrong about that, like we have been wrong about other things? Jack, I respect your opinion but I cannot agree. Like you said, the church has emphasized that it is literally true. And JS loses the right to be protected by context when he emphatically stated (as a prophet) that it was THE MOST CORRECT BOOK ON EARTH. I can see how the church can wiggle away from the literal truth of the bible – the church’s official position on the bible is that they have no position – but I don’t think the church can escape Joseph Smith’s comments. You can’t logically claim the Joseph Smith restored the one true gospel, did more for mankind than anyone save jesus only, and was wrong about the correctness of the BOM when he believed it to be literally true, said it was literally true, and the statement that it is the most correct book is printed in the introduction to the BOM. And further, if it’s not literally true, then what of the plates, and the testimony of the witnesses. If it’s allegorical, then there were no plates? I’ve only ever understood “the most correct book” as referring to the descriptions of the atonement of Christ, of the fall etc., doctrines I guess, not historical accuracy. Any other way of understanding it had never occurred to me. I don’t know why. But I’m finding the discussion on this point quite fascinating. I’m always rather puzzled by the fact that BoM peoples seem to have such a hazy view of their own geography-difficulties finding their way back from where they have come. Did they not have maps, set out to systematically explore their environments, have compasses? I guess a similar thing happened with the children of Israel in the desert. No-one seems to wake up one day and say ‘we’ve been here before and we need to go that way’. Very puzzling. All, since there is no agreement as to what the status of the land that Lehi’s little family landed upon (was it populated? Methinks so, but the text is silent one way or the other…), let alone precisely WHERE they ended up, proving or disproving the BoM based on Pre-Columbian archeology is, IMO, a waste of time and effort. Much the same could be said of the Israelites in so-called “Biblical” times, who were scarcely mentioned by their more powerful neighbors. For example, a catastrophic defeat of the Assyrians is mentioned in II Kings 19:35, with the 185K dead comparable to the Nephite casualty count at Hill Cumorah. Yet wherein do we hear the outcry of “where are the bones” or other artifacts related to this ancient Middle Eastern version of “Stalingrad”. Certainly the Assyrians didn’t admit to it. What ‘proof’ would suffice? A graffito saying “Gadianton was here?”. I don’t think Dr. Indiana Jones could find Zarahemla and it’s “lost treasures”. Waste of time is the operative word. The New World Archaeological Foundation been around since 1952 and the church kicked in funding. While they’ve done first rate work, nothing have been discovered that relates to the BoM. Much of the old testament is not historical. My two favourite books are Job and Ecclesiastes. The value of scripture is not history. Yet there is a Jerusalem. And there are the remains of several Assyrian cities despite ISIS. Jonah may not have been whale food, but there was a Nineveh. There was even a Church of the East. I hear these days the headquarters is in Chicago. So it seems there are more Assyrians in the America’s than descendants of Lehi. Why isn’t Mesoamerica on the list? Many BoM scholars believe the BoM lands straddle southern Mexico and Gualemala. Even as far back as 1927, LDS commentators James Sjodahl pointed out that the Book of Mormon is silent as to whether peoples existed prior to Lehi’s advent to the Americas (save for the Jaredites, their “lone” survivor, Coriantumr, living for some months amongst the Mulekites in Zarahemla), or lived alongside them, and afterwards (save for Moroni commenting that then-Lamanites, not necessarily being direct descendants of Laman and Lemuel, were hunting down surviving Nephites or anyone professing to believe in Christ). This is long before any “DNA” issues ever cropped up in regard to BoM authenticity. Therefore, it is quite possible that present-day native Americans, other ‘indigenous’ peoples of Central and South America, and many if not all Polynesians can trace their respective lineages back to Lehi. Naturally, he’s hardly the SOLE male contributor to their DNA. In fact, if one considers an average ‘generation’ to be about 1/3 of a century, or 33 years (average age of the father at birth), this gives some 70 TRILLION possible male ancestors in Lehi’s generation, a number which is ridiculously well above the numbers of peoples, let alone males, that likely have ever existed on this planet. Discontinuation of lineages, multiple marriages (or partners), and the occasional “I am my own Grandpa” tend to stir up the gene pool quite a bit. Judging by the small numbers in the party that came over on that boat about 590 BC, Lehi’s DNA has long been subsumed into the neighboring peoples, which themselves have likely experienced a similar genetic fate. I think MesoAmerica and Central America are the same thing. In considering archeology as a mean to find ‘proof’, it should be also kept in mind that not always are remains of cities, or battlefields, kept preserved. Scavenging and/or rebuilding, or abandonment, can rather quickly render a site unrecognizable. For example, look at the German capital, Berlin. About the only ‘evidence’ of the Nazi era are the ‘flak’ towers that have proved all but impossible to eradicate. Even though the location of the ‘Fuhrerbunker’ is known, for obvious reasons the Germans don’t commemorate it. Likewise, how easily can one NOW locate the route of the Berlin wall, after some 25 years of it easily being redeveloped? Even but a guard shack remains of the once-imposing ‘Checkpoint Charlie’. As those involved die off, who will remember what these structures were about? I recall a recent article about a German war grave, from the Battle of Berlin in April 1945, being excavated. The soldiers’ remains were, of course, skeletonized, but the gear and weaponry were in good condition, one of the Mauser rifles even capable of being fired. Considering that they were interred some 70 years in what’s essentially a bog, rather remarkable. We have an opportunity to witness the natural decay of an abandoned city, thanks to Chernobyl. The city of Prypiat, which had about 50,000 inhabitants in April 1986, is visited regularly, so to some extend the decay has been slowed, yet one can see how nature reclaims what man once proudly built. When one considers this, it seems rather dumb to proclaim that some PreColumbian location like Copan may be Zarahemla, or some such conjecture. The trouble is, while it could have been (but I seriously doubt it), since there’s evidence of occupation following the BoM period, AND the book itself describes dramatic geophysical changes at Christ’s death, there’s no way to assume that anything from that period would survive intact and could be recognized, even IF we knew just WHAT to look for..something in “Reformed Egyptian”, perhaps? Or something made of “Ziff”? The word for the day–admixture. Here’s where I mention that (disappointingly) I am only 2.6% Neanderthal. That was a grandparent that lived a long time ago. We aren’t just dealing with Lehi, he had sons and daughters. Marrying the right sort of people was so important they went back for Ishmael and family. Related people marrying related people and their children marrying each other. Oh yeah, no similar genetics there. We are not talking about one individual but a group. And they only other group they seemed to have noticed in this landscape is the people of Zarahemla founded by other refugees from Jerusalem. I dunno, maybe the son of the King of Judah wasn’t Jewish. But let’s say the Lehi family group moved into a city full of unrelated people. They were the elite, the leaders. So they would have commanded more resources, which means their surviving offspring would have more surviving offspring who would have more surviving offspring. That genetic signal is not the one weakening. Thought I would mention that I’m not talking about a plaque on Nephite wall saying “Alma was born here.” But an entire civilization. Or do you think WWll didn’t happen. Try to imagine a Rome Republic and empire with no roads, temples, villas,amphitheaters,aqueducts anywhere. No mention of Rome from their neighbors. And no Rome. #43 – Nice theorey, SNeilsen, but it hath a few flaws. First, Old Lehi had FOUR, count ’em, four sons, and by ‘co-in-kee-dink’, Ishmael, has FIVE daughters (the eldest hooking up with Zoram). Yes, marriages were arranged (I believe also that these marriages took place before they sailed off for the Americas). It was a simple matter of someone ISRAELITE (Lehi and his sons were NOT ‘Jewish’, or more properly, of Judah). The very fact that Jacob and his posterity basically had to flee from the posterity of Laman and Lemuel indicates that they were NOT dominant politically. Agree about ‘admixture’. That’s the very point. A party the size of Lehi’s, even if they were technically and economically dominant, would be rapidly subsumed into neighboring cultures, after several generations retaining little of their identity. Look at how dominant the Aztecs were but some 500 years ago, and for all practical purposes they’ve disappeared, being ‘admixed’ into not only neighboring tribes (without whose assistance Cortes would have found himself having his heart cut out and offered to the gods on an Aztec altar). Fortunately, their language does survive in a minority of Mexicans (about 1.0 to 1.5 millions). You’re only 2.6% “Neanderthal”? Some on this forum would attest that MY percentage must be higher. Added to the problem of genetics is that no one can be certain of what “Jewish” (or Judean, c’mon, even Mel Brooks, himself a Jew, got it right, it’s Joo-Dee-Ah…) DNA or that of related tribes (Lehi and his posterity were of Manasseh) was like at the time. Kinda tough with no control group. Present-day “Jews” have an enormous variety, themselves being ‘admixed’, particularly Ashkenazi Jews. According to Koestler (another Jew) in his work, ‘The Thirteenth Tribe”, most Ashkenazim are descended primarily from the Khazar people of the early middle ages (about seventh to tenth centuries) that lived on the steppes of present-day Ukraine. So taking DNA samples from a Native North American, or a native of the Amazon, or a Polynesian, will avail nothing either way, as these peoples have themselves admixed considerably since the BoM times. We “know” that WWII ‘happened’ b/c we’re but two generations from the time that it happened, and the same nation, same language, etc. We have the advantage of not having to rely on word-of-mouth as there are extensive libraries. Even from Roman times we have the Coliseum, the Forum, various bridges, remnants of roads, and aqueducts (Pont du Gard and the Milvian bridge come to mind), as well as plenty of Roman coins. Of course, the pervasiveness of Roman culture is apparently far more than likely the Nephite and Lamanite cultures ever amount to, even with more optimistic estimates. So are Jewish groups in India such as the Cochin Jews and Bene Israel. While I didn t know at the time that the DNA was from Europeans in South America, and not Native Americans, it still presents a problem. Cohen DNA is from the tribe of Levi, so even if it were found in the native population, it doesn t support the BoM, because it is from the wrong tribe. It is possible that Ishmael or some of the Mulekites were descendants of Aaron. So I would count finding the Cohen Modal Haplotype in pre-colombian(not post) native populations as evidence for BoM historicity. So would finding any pre-columbian Y-DNA Haplogroup J. So far, to the best of my knowledge, it only shows up post-columbian. As more testing is done, perhaps the picture will change.